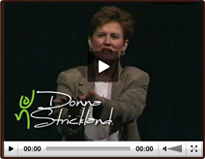 This seminar is a wonderful blend of Donna’s top three programs. It blends information regarding personal styles, managing change and transition and keeping a fluid spirit through humor skills. First, she looks at personal work behavioral styles, how your style (and those around you) changes when there is organizational tension due to layoffs, reorganizations, changes in strategy, technology and culture. Then Donna review William Bridges’ material on effectively managing the human side of change. It is a widely used and readily learned set of techniques for bringing people through the three phases of transition. It is powerful and it works. Then throughout the day the group learns humor skills to help keep a sense of perspective and to learn to lighten up in order to save our lives. This program can be customized to meet the needs and particular goals of the group. Data is gathered before the program through anonymous questionnaires, individual and/or group interviews such that the program can be customized to the group’s culture, phase of transition and particular needs. Where are people in the transition process? Option three would be a combination of day one and day two for a shorter program with topics covered as identified in the needs assessment. Hire Donna Strickland for a seminar by contacting us directly at (303) 808-4880.